Evergreen galloper The New Boy is favourite for the last race at Morphettville tomorrow and will be out to continue his excellent vein of form, which is quite amazing considering he was almost retired late last year. Tomorrow the gelding will instead be primed to win the final event at Morphettville in the hometown of his loyal owner's - the Antic and Worthley families. The last time the son of Rock of Gibraltar was in the final event on a card, thunderstorms and lightning lashed the Cranbourne racetrack on the club's Cup Day back in October causing the last race to be delayed. 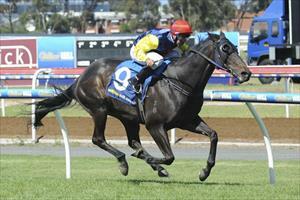 Then the usual ever-reliable galloper turned in a career worst performance by finishing last of 14. A neutral observer could have read into those weather conditions as an ominous warning that the seven-year-old gelding's career was done. Trainer Danny O'Brien thought as much. "I was thinking that it may be best to retire him off the back of that performance, however the owners asked that we give him one more run before we make any decision on his future." O'Brien went back to the drawing board with the old timer - re-applying blinkers and making what has turned out to be a critical adjustment to his training regime. "He may have just became stale with the training environment so we changed things up and started putting him over the logs a few times," O'Brien said. "It seemed to really pick him up and now every few days he will go over the big jumps and it appears this change has given him a new lease on life." At his next start, The New Boy returned to his best form, and broke a 31-month winning drought, by running his rivals ragged to win the Ballan Cup at Geelong on Stakes Day, pictured above. Since that race he has finished in the top 5 in five starts on Melbourne city tracks, including a last start second at Flemington. "His form reads quite well for this weekend's race and it would be great if we could give his owners the joy of winning on their local track with a horse that has given them so much pleasure. "The owners have been so loyal to the stable and the horse, and it would give us a great thrill if he could get the job done on Saturday." Despite only winning five races in his 48 start career, The New Boy has pocketed more than $387,000 for his owners courtesy of 18 top three placings on metropolitan tracks. The old stager also has the right jockey on board as he will be partnered in the 1550m event by white-hot 2kg-claiming apprentice Josh Cartwright, who will be out to continue his impressive metro strike-rate, which sits above 28% this season.